February 9 – no Farmers’ Market this weekend. Come back next weekend: 9 a.m. to 12 p.m.
Join Lindsay Sheehan, PharmD and Certified Diabetes Educator as she discusses innovative ways to deal with diabetes and how you can improve your health through diet, exercise, and medication. Audition songs, choreography, and monologues. Choosing material for your musical audition and executing it in front of a panel of masters takes as much practice, knowledge, and skill as your actual craft does. It is your one shot to show master teachers and directors who YOU are and why they would be lucky to have you in their production. This February, Davidson Community Players will host a Headshot Mini-Session and a Musical Theatre Audition Prep Workshop for actors (ages 8 and up) from 10am – 1pm on Saturday, February 9 at the Actor’s Lab in Cornelius. You will learn how to choose material that highlights your strengths, determine how to stand out throughout the audition process and to soak up every moment that you have in front of the audition panel. The Wildcats host Gardner-Webb – Come on out and cheer on the ‘Cats. All tennis matches are free and open to the public. Cheer on the Wildcats women’s basketball team in Belk Arena. The ‘Cats are ranked #2 in the A10, and need your energy to cheer them on against the Bonnies. The game is also scheduled to be available via ESPN+. Upon purchase we will get you scheduled for a slot. Please come dressed and ready, as hair and makeup is not included. This is an inexpensive mini session to get a simple professional headshot. Registration is open now and financial aid is available, please see our website or call the office for information. For additional details and prices, please visit our website or call the DCP office at (704) 892-7953. Percussionist, composer, and media artist Scott Deal is joined by Davidson College Artist Associate in Piano William Fried for a program of music for piano, percussion, and electronics that include both fixed and interactive media. For tickets, please contact the Union Box Office at 704-894-2135. 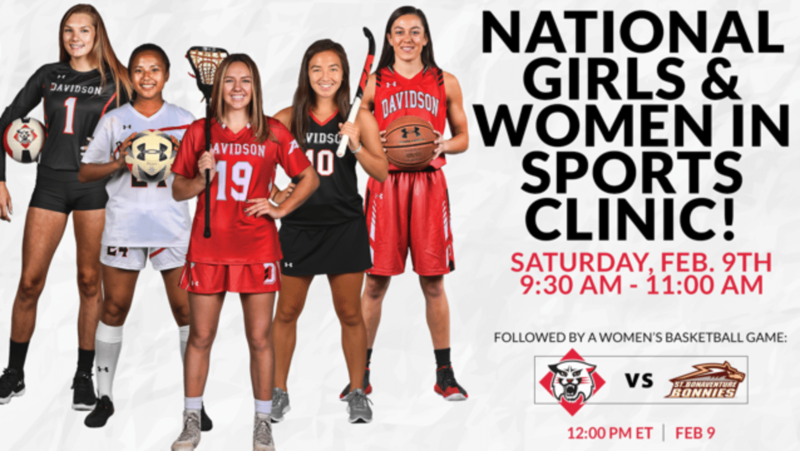 Free for Davidson students, but tickets are required. Davidson Community Players is seeking three energetic actors to perform all 37 of William Shakespeare’s plays in 97 minutes for their 2019 bonus show, “The Complete Works of Shakespeare (Abridged).” The play was written by Adam Long, Daniel Singer and Jess Winfield and will be directed by Christian Casper. Auditions will be held Sunday, Feb. 10 and Monday, Feb. 11 at 7 p.m. at DCP’s Actor’s Lab located at 20700 N. Main Street, Suite 112 in Cornelius. The production will run March 28 to April 7 at the Armour Street Theatre in Davidson. Bring your family (ages birth to 5) out to enjoy stories, songs, and movement activities that support early literacy skill development and help foster a love of books and reading in your child. The Rotary Club of Davidson meets on the 1st, 2nd and 3rd Mondays of each month (excluding federal holidays). Noon – 1:00 pm at North Harbor Club Restaurant. Meetings last about an hour. Visitors welcome! Children boost reading skills and confidence by reading to therapy dogs. The North Carolina Department of Transportation (NCDOT) and project engineer Kimley Horn invite community members to a project review session on the Potts/Sloan/Beaty corridor project on Tuesday, February 12 from 4:00 to 6:00 p.m. in the Davidson Town Hall lobby. Community members will get an update on the Potts Street and Sloan Street road connection, the sidewalk along the corridor, and the roundabout at the intersection of Sloan/Griffith/Beaty streets. They will also get information on the sister project, the roundabout at the intersection of Main Street (NC115) and Potts Street in Cornelius. This will be a drop-in session. Following the project review session, Kimley Horn will provide an update to the Davidson Mayor and Board of Commissioners at the 6:00 p.m. board meeting in the Davidson Town Hall board room. We encourage you to attend either opportunity. Men’s Tennis hosts Gardner-Webb – all tennis matches are free and open to the public. The Wildcats host the Mountaineers at John Belk Arena. All wrestling matches are free and open to the public.